Shop at Pole Fit Dubai! If you want to enjoy the experience of pole dancing in the privacy of your own home, develop your own dance moves with your friends or perfect pole dance routines learnt at the studio, we can offer you to buy your own X-Pole. X-Pole is the world’s leader in dance poles supply offering a great variety of pole dance equipment. All X-Pole products feature the most advanced engineering in the world of pole exercise and dance and have been developed, in consultation with leading dancers and fitness professionals, to meet the demands of pole dance professionals. X-Pole is easily removable, fully portable and does not damage ceiling or the floor. No ladder needed to install/uninstall the pole, no drilling or screwing. 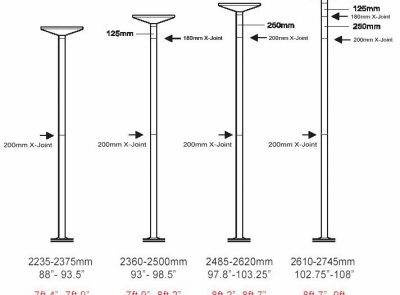 The X-Pole Set can fit the room with ceiling height from 7 ft.4” up to 9 ft. (2235 cm – 2745 cm). If your ceiling is higher than you will need extensions. There is a large range of X-Extensions (from 100mm to 1000mm ) available to fit a room with ceiling height up to 11 ft. (3370 cm). You may also need X-Joints for your extension. Please check this before purchase. 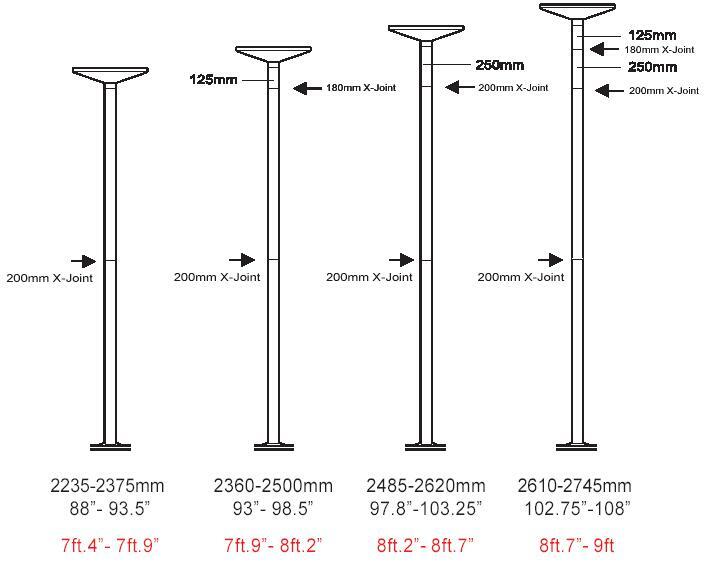 Below is a guided illustration to what extensions and joints you will need for different heights. 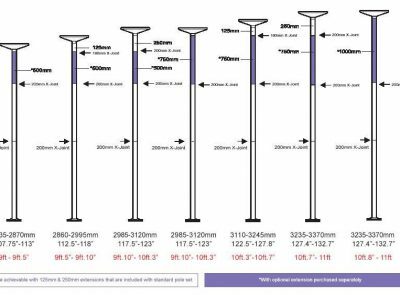 Below is the price for X-Pole sets including extensions to fit ceilings up to 3.2 m(10.6 ft.) high, delivery to your address in Dubai or Abu Dhabi and custom fees. If you want to order a dance pole, please contact us on 04-5516911, send a request on Facebook or email info@polefitdubai.com. 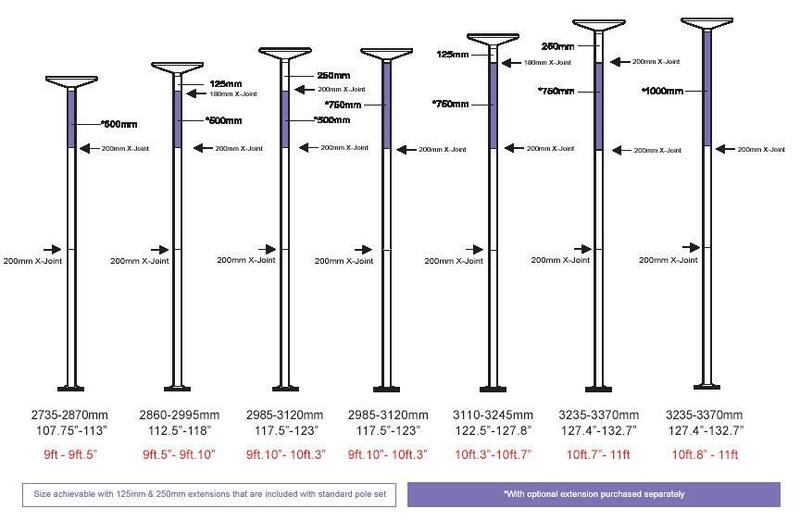 Please ensure that your ceiling is solid (not gypsum) and measure the ceiling height when ordering your pole so we can advise you on extensions and ensure the pole will fit correctly. If your ceiling is higher additional charges apply. The delivery usually takes about 7-14 working days. X-Pole Sport is a NON-SPINNING Pole. It is one if the most affordable Professional Grade Exercise/Dance Pole on the market. The X-Pole Sport is stationary, bottom-loading, and features the revolutionary X-Joint. It is offered in 50mm, 45mm and 40 mm diameter and in the Chrome and Titanium Gold finish. X-Pert is both SPINNING & STATIONARY. There is no other pole that is both stationary & spinning, bottom-loading that features the revolutionary X-Joint. It is the #1 Professional Grade Exercise/Dance Pole on the market!! It is offered in 50mm, 45mm and 40 mm diameter and in the Chrome and Titanium Gold finish.